As Bible readers, we are on a constant journey to seek God’s voice through Scripture and discover what it means to live as the Bible teaches. On this blog, we’ll discuss many topics — anxiety, joy, faith, trust, doubt, prophecy, salvation, biblical relationships, and more — seeking to know what God’s Word says and how we should respond. New articles are posted to the NIV website every Monday. 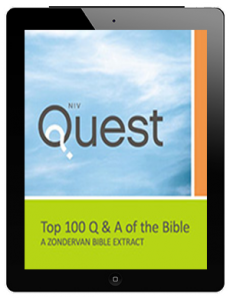 Sign-up below to receive email notifications of new postings and receive NIV, Top 100 Q&A of the Bible, a free ebook via an email sent to the email address you use to sign-up.